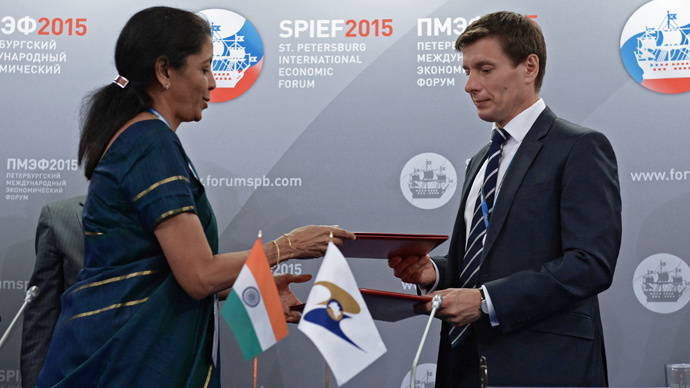 The Eurasian Economic Union (EEU) and India have started negotiations over the free trade zone agreement and signed a framework agreement at the International Economic Forum in St. Petersburg. "The two regions are big, anything done together should naturally lead to bigger outcomes,"said Indian Minister of State for Commerce Nirmala Sitharaman. The Eurasian Economic Commission (EEC) Trade minister Andrei Slepnev said the country was ready for a similar deal with Iran soon. “I think that in general this whole complex of measures forms a clear picture of our priorities for cooperation with partners in the Asian region, which now have the highest growth rate, and generally support the global economy,” he said. Trade between Russia and India fell to $9.5 billion in 2014 compared to $10.1 billion a year earlier, according to the data from Russia's Ministry of Economic Development. On May 29 Vietnam became the first country to sign a free trade agreement with the EEU. Russian Prime Minister Dmitry Medvedev then said that around 40 countries were holding talks on some kind of agreement with the union. The Eurasian Economic Union was established in 2014 based on the Custom Union of Russia, Belarus and Kazakhstan. Armenia became a member of the trade bloc shortly after it was formed. Kyrgyzstan is currently undergoing ratification procedures to join the EEU while Tajikistan is considering membership.